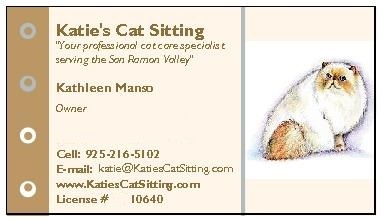 Your professional neighborhood cat care specialist in California's San Ramon and the Tri-Valley areas. Insured through PSA with Extra Coverage for Personal Property. Over 25 years of experience with cat care. Experienced in cat rescue and placement, specifically cats with socialization needs. Cat welfare as a whole has always been a focal part of my life. Pet CPR and Pet First Aide Certified. Serving San Ramon, Danville , Blackhawk, Dublin and surrounding areas. "For anyone whose cats are their family, Katie's Cat Sitting will be a blessing. I have used Katie to care for my cats for several years and it is such a gift to be able to go on vacation and truly never worry. My cats are comfortable with her and when we come home, they are relaxed and happy. Katie looks after your home as well (once calling me when a strange vehicle was parked in our driveway and another time replacing a smoke alarm battery so the chirping would not stress my cats.) She is professional, friendly, extremely reliable, and thorough. The proof is in how relaxed my cats are when I return home. What a gem!" "Thank you so much for taking such good care and for the detailed notes - I really appreciate it. She was fine when I arrived home." "... so upset we can't clone you for our new neighborhood ..."
"Thank you so much for the update. It gives me such peace of mind ..."
" The cats look great. Elizabeth came bounding down the stairs thinking you were back! I gave her treats so she wouldn't be too disappointed! Anyway, thanks again." "Thanks for all your help. If you ever need a reference, please feel free to give out my number. 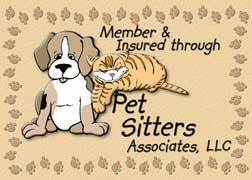 ..."
"We appreciate so much the sincere care and concern you have for our kitties! Thank you!!!"